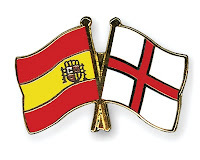 Friendly match between England Vs Spain will be played on 12-November-2011,Wembley Stadium,London at Time :15:00. England will be without Wayne Rooney for the fixture with Spain, Rooney will be suspended for the first three games of the European Championships and Capello has decided to leave Rooney out of the squad for the two friendly games taking place on Saturday and Tuesday. Hey there. I was thinking of adding a hyperlink back to your blog since both of our websites are based mostly around the same subject. Blogger: Sporty Arena. Be sure to let me know at your earliest convenience.